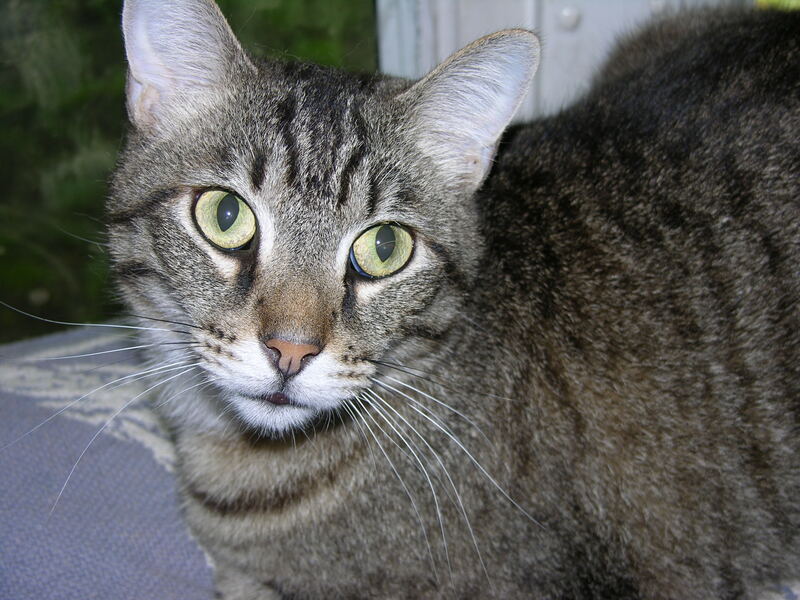 Food allergies in cats can be determined long distance. Please call Franklin Road Animal Hospital at 615-377-6457 for details. FOOD ALLERGIES IN CATS ARE MUCH MORE SERIOUS THAN MOST PEOPLE BELIEVE. Pretty much everything is going to be affected if your cat is allergic to its food. All of its organs, glands and tissues will be inflamed by the inflammatory phenomenon. We are what we eat! If we are eating substances that our bodies are hypersensitive to then our organs and tissues will be made up of substances that do not perform normally or right in the body. It is hard to stress enough the importance of not having allergic substances making up your body. This is especially true if we would like to maintain health and not get cancer or any other ailments that are aggravated by inflammatory processes such as allergies. THE MODERN DIET THAT WE ARE FEEDING OUR DOMESTIC CATS IS RESPONSIBLE FOR A LOT OF THEIR CHRONIC AILMENTS. This is even without developing an allergic sensitivity to these highly processed foods. I have the opinion that the more we adulterate the natural foods the more allergenic they become. If your cat were living in the wild he would have access to a tremendous variety of nutritious foods– spiders, crickets, cockroaches, frogs, rabbits, squirrels, mice, rats, chipmunks… Our domesticated felines on the other hand quickly become extremely picky and addicted to poor quality mainstream foods. These foods would be considered junk food to people. I acquaint it with someone getting a sugar high or carb fix. They seem to have lost their ability to forage and are brainwashed to stuff themselves on junk. In the Fall of 2010 I got a telephone call from a woman who lived four hours from our animal hospital. She told me that her cat had been suffering with diarrhea for five years. She had exhausted her local veterinary resources and was asking for help. I told her that more than likely it was a food allergy issue and that if she sent me DNA and a picture of her cat I could determine what the cat, Samantha Jane, was allergic to. She had tried switching cat foods many times before, but without positive results. We determined which foods were in her diet that she was specifically allergic to, and after mailing her the appropriate holistic allergy treatments to calm down her inflamed intestines, (not steroids), the loose stool cleared up within a week. The gracious owner was very happy. Although we have yet to meet her or Samantha Jane, we have continued to treat minor ailments throughout the year for both her and her new kitty sister, Marilyn Monroe. WHY DO CATS DEVELOP ALLERGIES? It has often been wondered for centuries why we develop allergies. It appears that there are now those that have come up with some plausible reasons why. If we remove all spiritual aspects, which is hard for me to do, we come up with some theories that are far from what I was taught in school. Soon after graduating from vet school I developed a theory that we often develop allergies to substances to which we were over-exposed or abused and our bodies are reacting to their constant pressure without relief. It doesn’t make good sense to take an animal that in the natural world eats a wide variety of foods and protein sources and then restrict them to a limited number of sources that are repeated day after day for year after year. Many cats are fed the same flavor of cat food for four to six years. If this food is deficient or has an excess of any nutrient it will be accentuated because the inherent natural varied protein balance provided by the natural assortment they were designed to eat does not exist. Then the owners come to me and wonder why their cat, out of the blue, has suddenly refused to eat the prepared food and has developed allergies, cancer or other seemingly unrelated illnesses. The seemingly nowhere would have to preclude that no one ever questioned the cat’s diet. I believe that often we develop an allergy to a food substance that was not natural for us, such as a cat, a desert animal, developing an allergy to a huge ocean fish like a tuna. For many years veterinarians and allergists essentially left the cause of allergies blank because they did not know the answer. It appears now that a good working theory, even if not complete, is that animals, including people, develop allergies as a defense mechanism to make us uncomfortable so we will avoid a situation that has caused us trauma in the past. This can either be emotional or physical trauma. For a cat, this could be the introduction of a new four-legged feline family member. (Sometimes they get along with dogs better.) The kitty may have just learned to adjust its former solitary lifestyle by learning to share space with his two-legged guardian. Trauma could also be caused by a trip to a boarding facility, being spayed or neutered, a serious illness or accident. All of these trauma producing events are likely to produce an allergy. Years ago while being mentored in deliverance ministry I was taught by a very knowledgeable lady that allergies were a sign of a demonic spirit of infirmity. I am not sure that developing an allergy as a consequence to an extremely traumatic event is not a natural occurrence. This would be a design in our makeup that has been found beneficial in the long haul or we would not have it. When the situation gets to be excessive or out of the ordinary, I believe we need to look at it from another perspective or at least consider other alternatives. We have found because foods are somewhat limited and are constant in an animal’s environment, they are more easily detected and dealt with than pollens from crops, grasses, trees, molds, and household antigens. The goal is a compromise. Get the kitty below the adversity threshold level. Get him to where he can tolerate life and not have diarrhea or itch incessantly. This should be able to be done without having to have monthly visits to the vet clinic for corticoid steroid injections. We also hope another result will be optimum health beyond expectations. Not long ago I treated a poor kitty that had a history of a sensitive stomach for years. The cat within the last year had been diagnosed with gastric (stomach) cancer and the owner was not able to afford what was presumed to be a life-saving surgery from another clinic. The cat’s stomach was in such bad shape that he had difficulty consistently keeping down any food. This was coupled with the fact that with a lot of cats it is very difficult to switch foods. I discerned what in his food he was allergic to and recommended he no longer eat any more of it. Unfortunately, I was not able to salvage this kitty, but tried to console the owner with at least the knowledge of why it had developed gastric cancer – from constant exposure to foods he was allergic to which caused chronic inflammation. We have developed a technique that can detect most of these food allergies on your kitty long distance. Years ago I was told by a learned veterinarian that she was able to detect a current disease condition in an animal from whom she had collected blood years ago. She said the DNA of the pet changed with his changing conditions over the years. The DNA gave accurate information about the pet’s current condition years after it had been collected. This was initially hard for me to swallow, but since that time I have seen first-hand that DNA never loses its connection with its host. There has been much advancement in the study of quantum physics and related fields in the last few years. The U.S. army had conducted experiments of this phenomenon with our tax dollars as reported by Kevin Trudeau (Natural Cures “They” Don’t Want You To Know About, 2004, p263), where a person was subjected to various conditions and the response of their DNA was first measured in a separate room and then moved up to fifty miles apart. Interestingly, the response of the DNA relaxing and tightening its coil was faster than the speed of light. It seems that we are all instantaneously connected to ourselves. Even our cats are instantaneously connected to their parts. This is a little known principle or law of the universe. We have personally seen this apply over great distances such as from Middle Tennessee to Arizona. Please phone us at 615-377-6457 for detailed instructions on what we need to conduct these allergy tests for your cat long distance. Be sure to provide our staff with a complete food ingredients list including any treats, supplements and medications. There have been extreme cases where we’ve had to put on our Sherlock Holmes hat and figure out that the allergic reaction was coming from a favorite blanket, toy, shampoo, yard treatment, essential oils, or other antigen sources. However, most of the time it is fairly simple and the culprit is a food ingredient that is constant. We have most food samples, either dry or frozen, at our clinic. We shall determine your cat’s sensitivities and quickly communicate them to you with recommendations of how to stop the travesty. About the author: Dr. Mark C. Ingram has been practicing veterinary medicine since 1973. He began exploring alternative modalities in 1974. He is a member of the American Veterinary Medical Association, the American Holistic Veterinary Medical Association, the Tennessee Veterinary Medical Association and is a veterinary chiropractitioner. His holistic small animal practice is located in Brentwood, Tennessee. For more information on holistic veterinary pet care please visit our website at www.holisticpetcaretn.com. EMAIL: holisticpetcaretn@gmail.com if outside the state or country.